Home pregnancy tests are 99% accurate. However, even the most reliable test can give the wrong result when some other factors interfere with it. 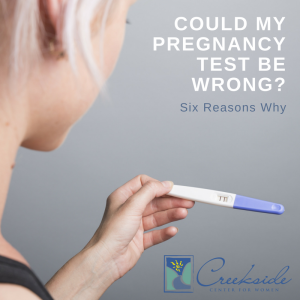 If you’ve taken a pregnancy test and are confused, read about six reasons why the pregnancy test may have been incorrect. Home pregnancy tests can pick up HCG (human chorionic gonadotropin). After the fertilized egg has attached to the wall of your uterus, your placenta’s cells produce HCG. This hormone helps the egg grow, protect it from immune reactions, and assist with progesterone production. In a home pregnancy test, you pee on a small stick that detects if HCG is in your urine. Here are six reasons why the + or – sign may be incorrect, and you’ll want to get a second opinion. Cancers produce hormones, and ovarian tumors can increase the HCG hormone. HCG is at its highest level in the morning when urine is fresh and not diluted by the liquid you drink during the day. If you test in the afternoon, your urine may not have enough HCG to detect. After a miscarriage, your body still has hormones that will lead to a positive test. Most medications—antibiotics, birth control, over-the-counter medicines, won’t alter the pregnancy test’s accuracy. But if you’re taking fertility drugs or are participating in a weight loss program that uses injections, your urine may show traces of HCG. If you take a pregnancy test a day or two after a missed period, the test may not detect HCG. To increase accuracy, take the test a week after a missed period. Set a timer according to the package instructions to give the test time to work. What Should You Do if You Think the Pregnancy Test is Wrong? • Make an appointment with your doctor. You might need a blood test or ultrasound to confirm your pregnancy. • Repeat the test in two to three days, especially if you took the test just after a missed period. • If you continue to get negative test results, but your period doesn’t begin, check with your doctor. Other conditions can lead to missing a period, including low body weight, excessive exercise, stress, thyroid disorders, etc.